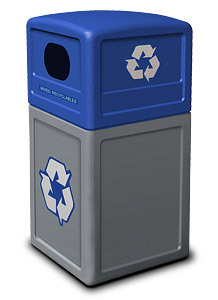 Extremely durable these Recycle42 recycling receptacles work great for both indoor and outdoor applications. Every receptacle ships with decals to create a customized recycling center tailored to fit the environment. Decals included; Plastic Bottles, Aluminum, Glass, Plastic Bags, Paper, Mixed Recyclables, and Trash.